Lisa seems to have a habit of chewing gum. Do you? Which of Lisa's boyfriends seemed the nicest to you? Should I feel guilty kwa association cause I knew an LE stalker as she stalked LE and stuff went down? Does anyone take requests to make wallpapers? Custom of course! What happend to Lisa Edelstein Fanbook Project website? I was to send the letter and boom! - the page is not found. Hi everyone! I already ilitumwa the link to this, but apparently some of wewe didn't find any important information in it? So I'm here to inform wewe all on the project. Alright! So basically, we're putting together a book of letters to send Lisa for her birthday. Where to go after you've been a conquest of George Costanza? Smell the coffee? Smell the kasha! For Lisa Edelstein, everything has been looking up. 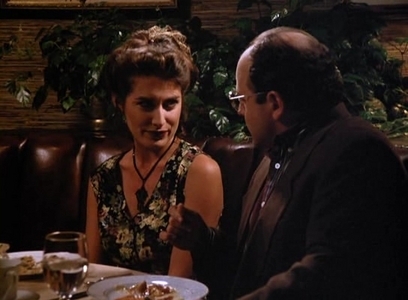 Indeed, the "Risotto Girl" of "Seinfeld" has never felt zaidi ... fulfilled. I'm adding this one because I found it in mine bookmarks... I guess it means it's pretty fantastic. Vegetarian: when she was a teenager, she ate some bad meat and had horrible nightmare at night with eating human flesh. Since then, she doesn't feel right with eating meat. Hottie with balanced diet: around her twenties I think, her metabolism changed, she got her lady curves, but also gained much weight. Since then she really had to take care about that she eats (no unhealthy food). For some time she had eating disorders.That's why it's so important her her to control her chakula now. I just wanted to have one place where I'll have all the information. Wouldn't it be nice to share it at the same time with you, guys? I remember being interested in Lisa's upendo life few years zamani and of course first clue was Petri. After that, I was interested in their break-up, because, I think, it was the most opened to the public of Lisa's relationships. [i]“It’s not easy to upendo a tv star”, says Petri Räisänen. a comment was made to the question: Did anybody else noticed this big scar on her left leg(right side on the photo)?